Coat of dreams, come to mama! So what is an Afghan coat? 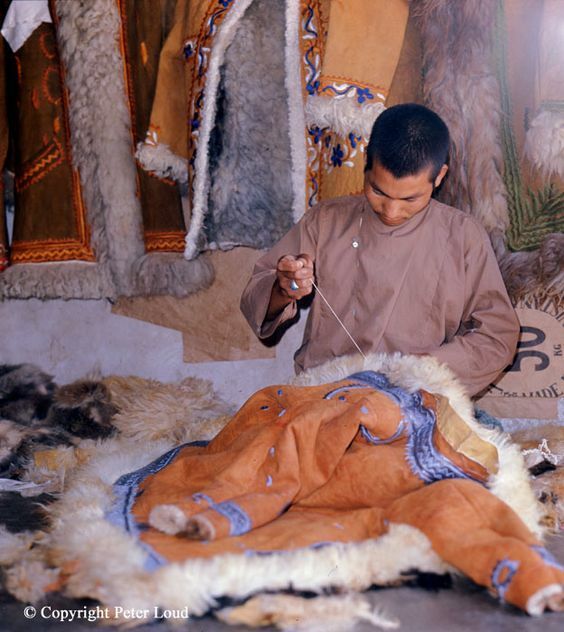 Usually made from sheepskin or goatskin with the fleece on the inside and soft, suede-like leather on the outside, they were developed from the traditional overcoat worn by the Afghan tribe known as the Pashtuns and originate from the Ghazni province situated between Kabul and Kandahar. 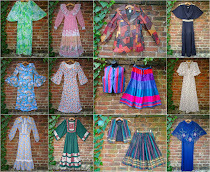 Afghan coats were first imported to the UK in 1966 (the best year known to man, but of course I'm biased) by Craig Sams, who sold them through hippy boutiques including the legendary Granny Takes A Trip. 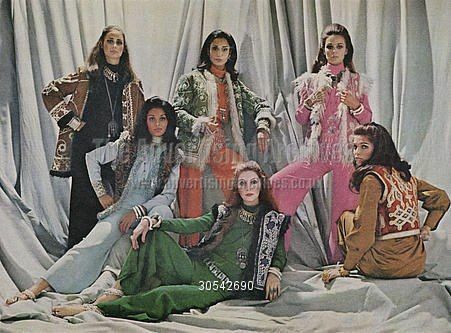 By the late 1960s, Afghan coats were Afghanistan’s biggest fashion export, frequently featured on the pages of Vogue and copied by designers for the chicest hippies longing for adventure along the Silk Road. I've wanted an Afghan coat for as long as I can remember. 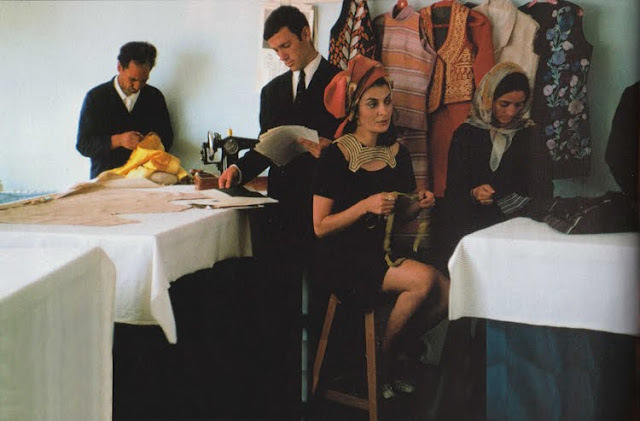 When 1970s fashion had a revival in the early 2000s I bought a caramel-coloured fake suede one from River Island's sale, it was passable but, like all repro, lacked the integrity of the real thing and eventually got donated to the charity shop. I'd always had my eye on my Mum's which was off-white,colourfully embroidered and stunk of patchouli oil but, after she died, my dad had started to lose his mind and it vanished, never to be seen again. About eight years ago Jon and I spotted a beauty at a car boot sale but it was £100 and we didn't have enough cash with us. I've kicked myself ever since - after years of searching I rarely find anything for less than £150. A few weeks ago I had a bit of a tidy up and decided to stick a few of the bits and pieces I'd rescued from the parental home on eBay - figuring that I'd hardly miss stuff that had been stuck in a drawer for over a year. I was stunned at how much a few empty antique jewellers' boxes, eyeless teddy bears and tarnished EPNS sold for and decided that, after buying a few pieces for the house, I'd treat myself and placed a bid for an incredible blue Afghan coat that I'd spotted on Ebay. However, I'd forgotten that it's currently the silly season and most of the world are obsessed with buying Xmas tat, so I won my coat for less than half the price I'd been prepared to pay! Hooray! It arrived yesterday and hasn't been off my back since. I suspect that, like the Afghan dress I'm wearing underneath it below, it'll be a permanent fixture in my Winter wardrobe for decades to come. 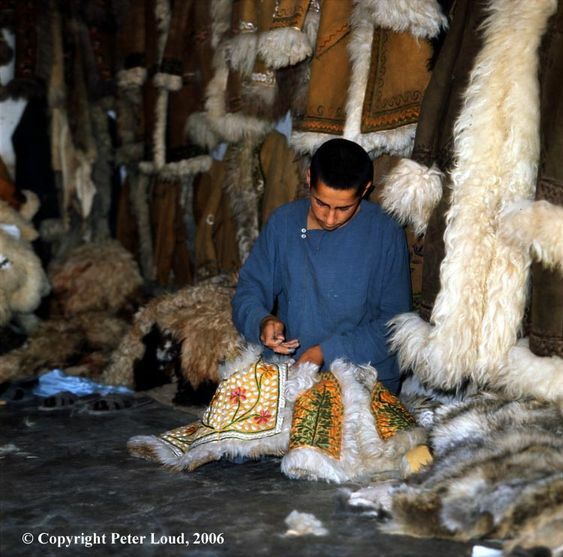 I love that my coat was made by hand in a little shop in Afghanistan just like this one, snapped by intrepid traveller, Peter Loud in 1974. Firmly on the overland trail in the 1960s & 1970s, I've spoken to many an old hippy who recalls with fondness the time they spent in Afghanistan. Once legendary for the quality of its hashish, the hospitality of its people and its stylish architecture, it's hard to imagine that it's the same Afghanistan we see portrayed today, decimated by thirty years of war, and now a broken, almost Medieval country. 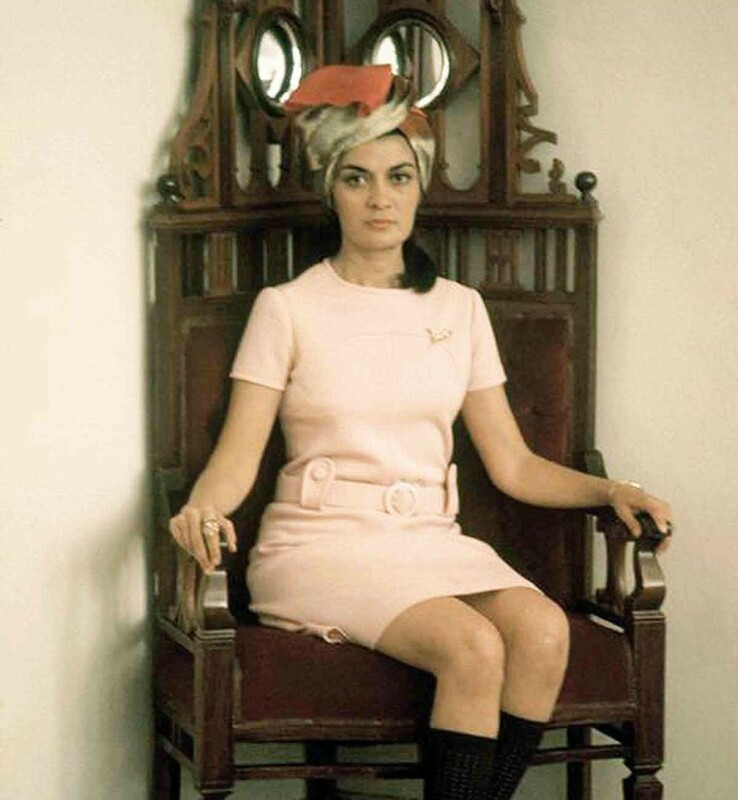 Kabul was once known as the Paris of Central Asia and pictured above & below is Afghan designer Sarfia Tarzi in the late 1960s. 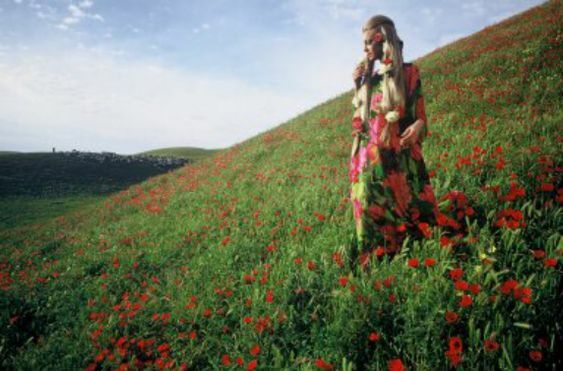 In 1969, American Vogue, led by photographer Fred Maroon & accompanied by a team of stylists, flew to Kabul to shoot Afghan Adventure which featured both the sights and the fashions of Afghanistan and was published in the December 1969 edition. 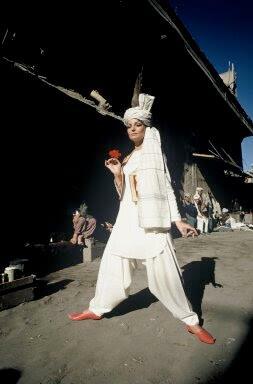 The fashion story saw beautiful models posing in front of various backdrops of the hippie trail, blazed by an endless stream of young Americans and dope-smoking Europeans searching for alternative tourism since the 1950s*. In the background of photo above is the ancient ruin of the 175-foot-high Buddha statue, the tallest in the world, which was destroyed entirely in March of 2000 by order of the Taliban, on the grounds that they were an affront to Islam. Where Genghis Khan had not succeeded in fully destroying the statue during his 13th century siege of the valley, the Taliban finished the job 8 centuries later, taking something from Afghanistan that could never be returned, leaving nothing but an empty shell. 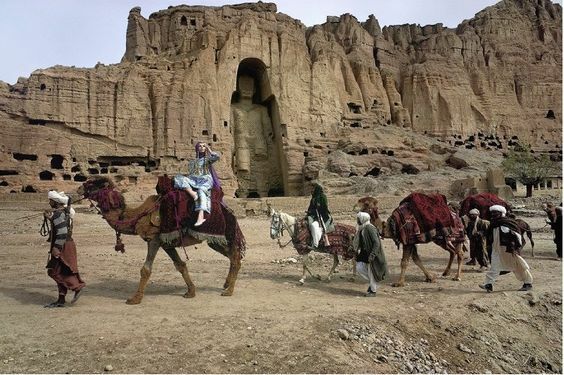 In the valley that once marked the cultural meeting point of East and West, its archaeology revealing a blend of Greek, Turkish, Persian, Chinese and Indian influence, the carvings and caves of the Bamiyan cliffs now only serve to house Afghan refugees made homeless by decades of war and chaos*. Another of the photos captured the model wearing sheer trousers and sitting for afternoon tea near the Russian with the elder Kochi tribesmen. For travellers of the Silk Road, the Afghans had a great tradition of hospitality towards visitors and valued the well-being of a guest over their own*. Testament to the skills and resilience of the Afghan people is how they turned their troubled history into an art form. This is my War Rug (or Baluch) which I found in a charity shop a couple of years ago. Afghan rug makers began incorporating the apparatus of war into their designs almost immediately after the Soviet union's invasion of their country in 1979 and continue to do so today in the wake of the United States' 2001 invasion which ousted the Taliban government but sadly failed to bring an end to the violence. 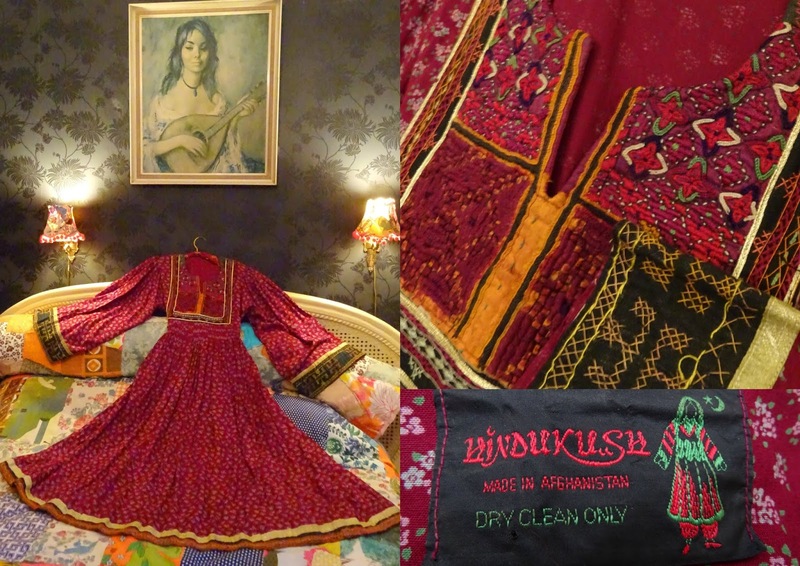 By strange coincidence the dress shares its name with one of my favourite books, a Short Walk in the Hindu Kush, written by Eric Newby who was, like me, born on December 6th. See you when I'm 52! Happy Birthday, Vix!! Wow, what a history lesson on these gorgeous coats and the influence of Afghani work on modern fashion. I love seeing the pictures of that photo-shoot. What a terrible shame that the Buddha statue was destroyed - I remember when that happened. Happy birthday for tomorrow! Your coat looks fab! I found my own Afghan coat a few years ago in a usually overpriced local vintage shop, but it was before the hipsters had decided they liked the 60s and 70s stuff so I got it for a bargain. I still find them locally from time to time, I found one in a local antiques mall last year for £60 and wished I'd bought it even if I'd just sold it on as they go for such silly money. I've won all sorts of amazing things on eBay this time of year because no one's looking at it, it's definitely the best time to buy! years ago i made friend with an afghan chap - he and his family fled after the russian/soviet invasion. his mom & dad were teachers in kabul and he told me how modern and chic kabul was before the war..... as your post prove it. thanks for the fabulous vogue photos! Such a pleasure to hear something marvelous about Afghanistan after all the horrors of war and destruction, Vix. 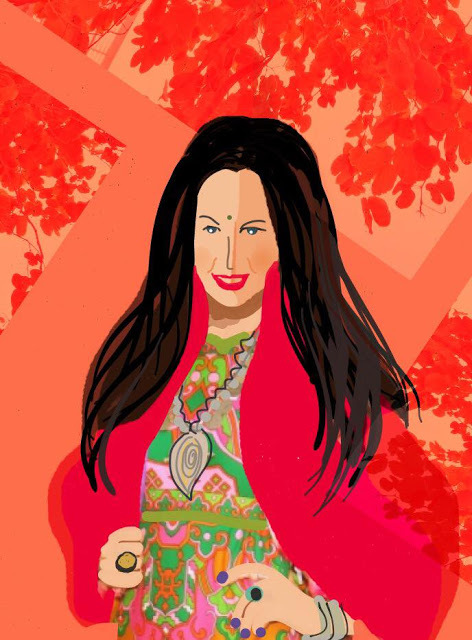 You look fabulous in your Afghan coat. What a happy birthday present for you. Happy 52nd birthday, Vix. I wish you health, wealth and happiness! I love your Afghan coat. 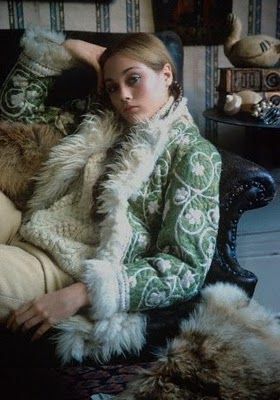 I never had a Afghan coat in the sixties but I had an embroidered waistcoat which I loved and wore to death - but oh the smell! 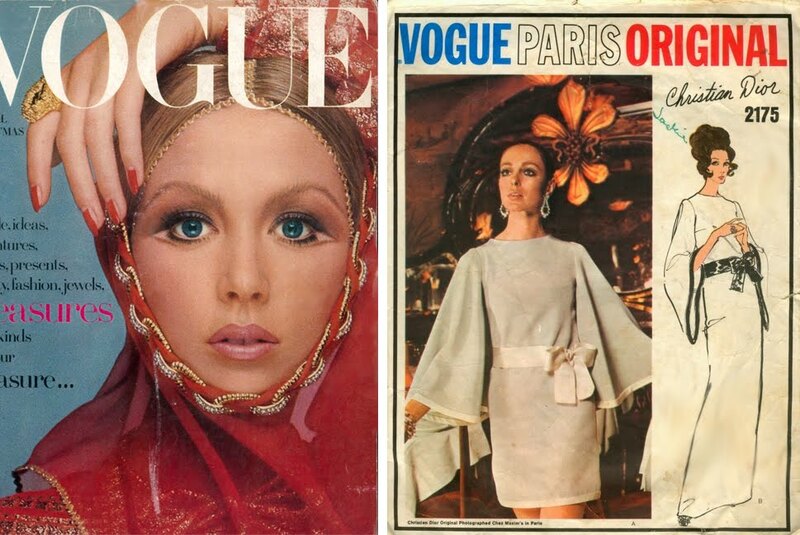 That Vogue edition features the most wonderful clothes in wonderful settings - what an excellent historical record of things that no longer exist. It's one of the countries I am still hoping to get to visit one day. Your new dress is magnificent! I hope we both get to see Afghanistan some day. It's utterly tragic what has happened to that beautiful country. Hello, birthday greetings. I love how you marry your very individual and personal style choices with an impeccable and in depth knowledge of the history and cultural significance of the pieces. Keep flying the flag for intelligent vintage lovers everywhere! My brother had a cream coat and my over riding memory is the smell. He loved that coat and wore it summer and winepter tor the three years he was at college in the late sixties. He eventually grew a beard as everyone thought he was a girl with his shoulder length curls! 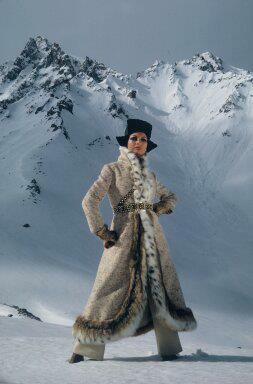 What a fabulous coat and dress! Have a wonderful birthday - Many happy returns of the day. Happy birthday! My best friend had a boyfriend with long flowing hair who also wore an Afghan coat. They married and got an Afghan hound! I married someone who was once a mod, had short back and sides and would never consider anything more exotic in clothes than from Burtons! She and I are still good friends btw, but ditched both guys along the way! Happy Birthday! Both the coat and dress are amazing. I bought one of those knock-off coats in the 2000s as well-it shed horribly. Glad you found the real thing. 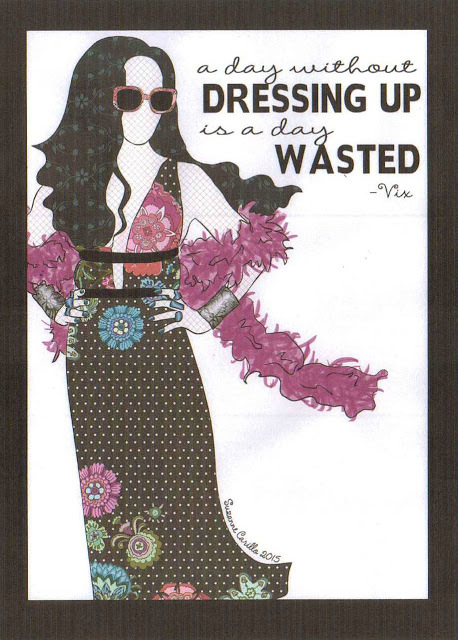 It is SOOOOO you! Afghanistan shares a border with my husband's native Kashmir. The traditional styles of both regions overlap quite a bit. 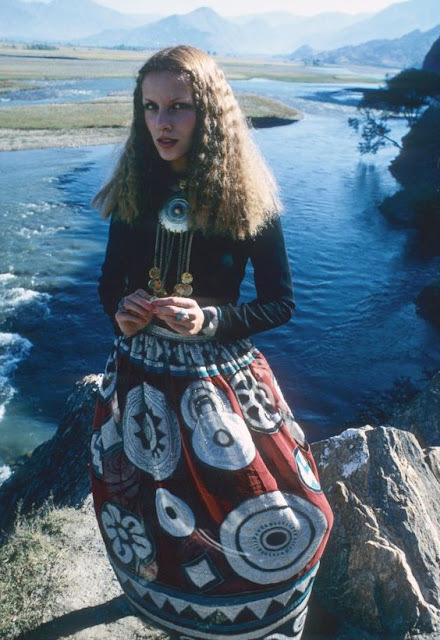 Love that coat & am drooling over that Suzani patterned skirt & necklace the blonde model by the river is wearing. Happy Birthday and may you do 52 as nobody else can! A Happy Birthday to you! You know, it's not enough that I covet your jewelry. Now I have coat envy! Wishing you a very Happy Birthday Vix. I am so pleased that you got your Afghan coat. It looks wonderful and so does the dress. I worked with a friend who did the hippy trail back in the day, on her own! How intrepid was she? It's unbelievable that it was possible to do that now isn't it? I remember the destruction of those statues, it was dreadful. The Kite Runner is devastating, isn't it? Good for YOU! Happy birthday, dear Vix! And thanks for the education! I learn something every time I read your posts.. Thanks for sharing your enthusiasm and knowledge on 60's fashion and history (ohhh, that Vogue edition has stolen my heart). Love that you're spreading the world with loads of hippietastic attitude! Happy Birthday! I hope your day is AWESOME! Happy birthday my lovely!!! What lovely finds for your birthday! I too wanted an Afghan coat. There was a repro one in my local charity shop for £5 recently which I ALMOST bought but decided I had too many coats. Wish I had now! Your one is glorious! Have a great birthday! It's a place I've read a lot about over the years and always wanted to visit but like many places it has not been possible because of the political situation. sovery sad for the people there. I must though I have always detested Afghan coats. I can't stand the smell or feel of them or sheepskin coats, sets my teeth on edge like scratching a blackboard does for some people. Wouldn't do for us all to be the same! I hope you had a marvelous Birthday! (I DM'd you on Instagram on your birthday) This is such an entertaining post - really enjoyed the fashion shots and the history lesson. I saw an exhibit of Afghanistan War Rugs at the Textile Museum in Toronto a few years ago. The owners of my neighbourhood thrift store are from Afghanistan, and they have some gorgeous Afghani textiles displayed on the wall of the store. I remember how sad I was when that Buddha statue was destroyed. It is terrible what has happened to Afghanistan. I'm pretty sure there are power groups in the West that support the Taliban and terrorist so they would have an excuse to fight their oil wars. Western governments are corrupt, they don't even take care of their own people. I'm not very optimistic about the future, but potential of human spirit is endless so with the bravery o its people a part of Afghan culture is still preserved. 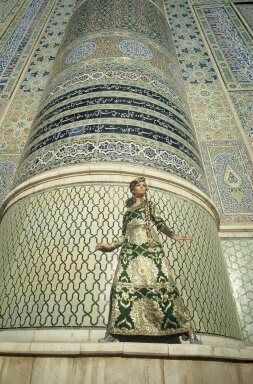 Lovely Afghan coat and vintage dress.